T70 with Quad Core i7 mobo for T6x is coming!! Re: T70 with Quad Core i7 mobo for T6x is coming!! Buying a camera is excessive... I think a regular cooking thermometer measuring at the beginning, middle, and end of a pipe would work alright for this. It's not super necessary though. Seggybop wrote: Buying a camera is excessive... I think a regular cooking thermometer measuring at the beginning, middle, and end of a pipe would work alright for this. It's not super necessary though. I have a laser thermometer, but it doesn't work well on metallic surfaces. I could try putting some thermo-resistant vinyl tape on top, but first I'm away for a week. pflugshaupt wrote: I have a laser thermometer, but it doesn't work well on metallic surfaces. I could try putting some thermo-resistant vinyl tape on top, but first I'm away for a week. Metallic surfaces may not work but those blue thermal pads could be accurate since they conduct heat well. Interesting thread...anybody else get a T70? Update on the heatsink. I think I have it under control now. I removed some more material from the frame around the inductors and then removed and reseated the heatsink after reassembling everything. PCB flexing was probably contributing to the problem. Temperatures are now within 5c with everything tightened down. So to summarize, make sure that the frame isn't impeding the clamping of the heatsink through whatever means necessary, and then reseat it it after you've screwed the frame back into the shell. I'm interested in seeing if ElusiveRoberto has similar problems. Yeah, it definitely requires some work right now. However, I think zhangyongtao (jacky) will sell you a prebuilt. I will be doing some heat tests tonight, everything is assembled! Edit: My heatsink wasn't rough but it looked similar to the others, sort of smooth. I was a bit confused what to do with the USB 4 cable until I saw someone on 51nb show the original cable ending in a new usb port floating at the end of the cable, I think they thought they could get the vertical usb on a cable going there. The 2nd wifi antenna was a bit annoying to have to fix, I'm going to just buy and install new cable rather than splice one like they say. Although it says the next batch will include that cable. The removal of the metal is sort of not the best. The 4 vrms I believe thats what they are, the last one hits the bottom of the metal frame sort of which isn't mentioned. I figured out which way to put the screen switch but this wasn't mentioned. I did run a short stress test earlier though. It seemed to take a long time to get the temperatures to increase. Will do a proper aida64 test later. I didn't notice the idle temps being very high, but I will measure it more later. -On aida64 I seem to get around 95 degree temperature average after 15 minutes. They hover around 45 at idle. I have a uxga screen coming so I will do modifications to get the heatsink to fit better. Why does Speedfan report my core temps as mid 30s? but then aida shows them in the 50s? I would assume aida is the more accurate program though. I've applied the liquid metal TIM (phobya) and temperatures are much better. There's one core that's spiking above the others during stress tests (but not real-world testing of rendering) that's kind of weird, but even that is still better than before. Results are similar pflugshaupt's with iGPU also being stressed. I'm pretty confident that the limiting component of the heatsink is the solid copper block and if I ever find a source for vapor chamber parts I'll try replacing it, but no idea where to find one for now. You should really try undervolting. 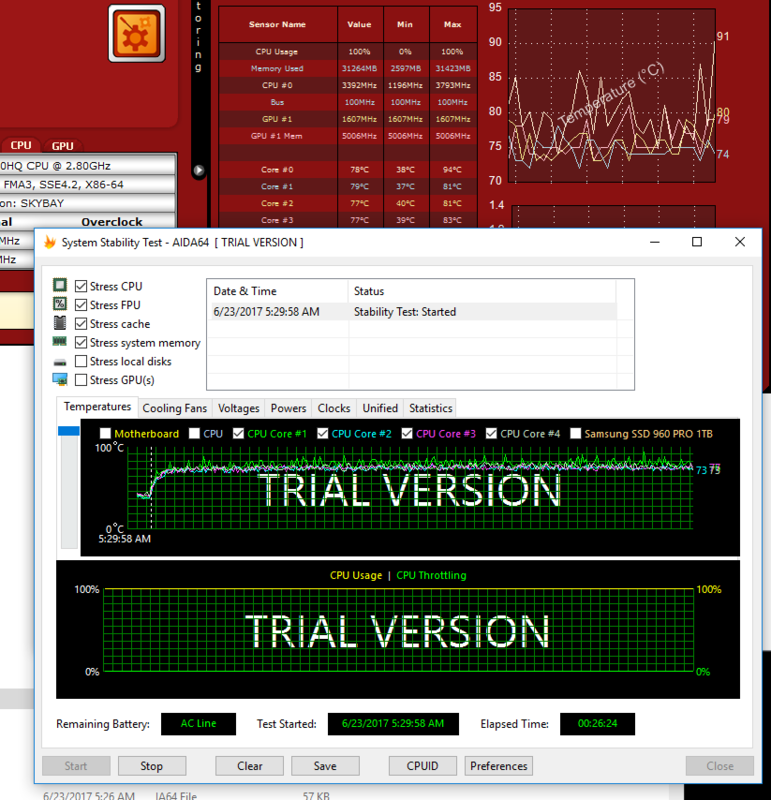 I'm now running -125 mv on the CPU and it is stable and I also use Throttlestop to undervolt the iGPU with -50 mV and temps are very reasonable now. Did you do -50mv on iGPU both slice and unslice? First I just used Throttlestop's single setting to detemine whether -50 mv was stable and now I use -50 in the BIOS on both slice and unslice. I don't know what these mean though. I've been having the worst time with the Trackpoint and Touchpad drivers on my T70. I've manually installed the ones linked in this thread and the newer ones on the 51nb forums, but nothing seems to work in Windows 10. Both trackpoint and touchpad are totally dead, and now my keyboard doesn't work after reboot until I reinstall the ps/2 keyboard driver through the Device Manager. Troubleshooting this is hell. At least my temps are ok. Not the best, and I plan to do some testing once I get these stupid navigation drivers working right. edit: apparently this is a widespread issue. I thought it was addressed in the September 2017 BIOS update, but reading through the thread it seems like it is still an open problem. Only fix for now is to keep restarting until devices are recognized. I'll try to shutdown since restarting doesn't seem to help. Same here. I had no startup problems with older BIOSes and the generic ps2 driver. Now it seems keyboard+trackpoint at least keep working after sleep, but I usually need to boot up twice to get everything to work and sometimes even need to plug in an external mouse just to click that restart button. The driver they now recommend on 51nb doesn't even support the trackpad, so it's pretty much useless. Let's hope the next BIOS update helps. Paypal gift and shipping will not be tracked because of the hugely expensive overseas shipping from NZ.